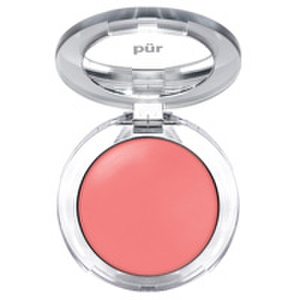 Get a gorgeous, age-defying glow with PÜR Minerals Chateau Cheeks Cream Blush. As you color and accentuate your cheeks, your skin will drink in the anti-aging benefits of vine-fresh Resveratrol—harvested exclusively for PÜR from Bordeaux’s famed wine region. Resveratrol is an antioxidant commonly found in red wine known for its anti-inflammatory benefits. It’s been shown to soften the look of lines and extend cellular lifespan. We are able to infuse this ingredient into an incredibly long-wearing formula your skin will love. Brightens the appearance of hyperpigmentation. Protects and nourishes the skin. Moisturizes and improves skin barrier function. Using a Blush Brush, glide Chateau Cheeks Cream Blush over the apples of your cheeks, blending up to your hairline. Mica, Boron Nitride, Zinc Stearate, Octyldodecyl Stearoyl Stearate, Octyldodecyl Stearate, Silica, Propanediol, Argania Spinosa Kernel (Argan) Oil, Calophyllum Inophyllum (Tamanu) Seed Oil, Glycine Soja (Soybean) Seed Extract, Aqua, Phenoxyethanol, Caprylyl Glycol, Vitis Vinifera (Grape) Vine Extract, Vitis Vinifera (Grape) Root Extract, Ceramide 2, Sorbic Acid. May Contain: Mica, Titanium Dioxide (Ci 77891), Iron Oxides (Ci 77491, Ci 77492, Ci 77499), Red 6 (Ci 15850), Red 7 (Ci 15850), Red 27 (Ci 45410), Yellow 5 (Ci 19140), Yellow 6 (Ci 15985), Bismuth Oxychloride (Ci 77163), Manganese Violet (Ci 77742), Ultramarines (Ci 77007), Tin Oxide, Carmine (Ci 75470). Contains carmine as a color additive.